WASHINGTON STATE — Wildfire burning near Kalama in Cowlitz County started on Monday, July 16, 2018, from an unknown cause. 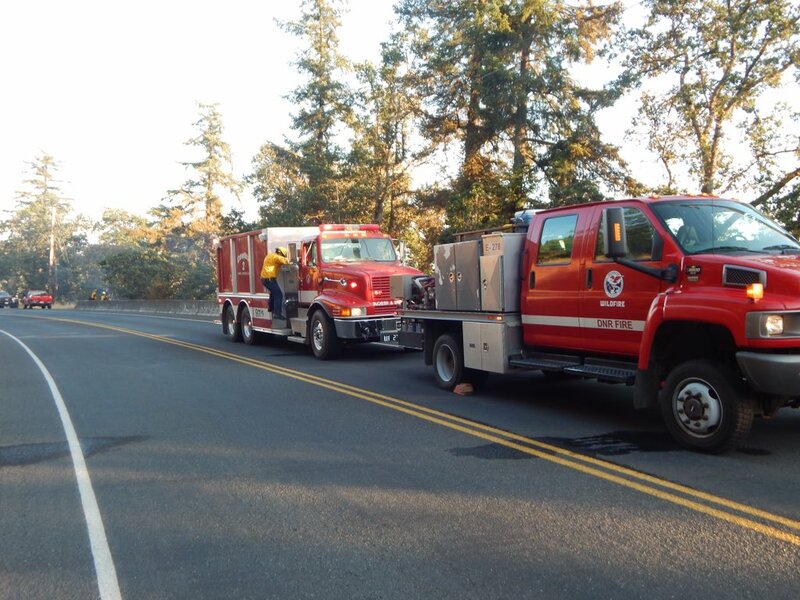 More than 70 Interagency personnel worked together during this incident including WA DNR, Cowlitz Fire Districts 1, 2 and 5 along with the Sheriff’s Office and Kalama PD. Acres burned remain the same. UPDATE 1 – July 17, 2018 – 0530 hours PDT – Newly reported fire. Pacific Highway was expected to be reopened during the night as fire crews were blocking for fire suppression activities. Drivers were highly encouraged to use a detour around the area. There were originally three DNR engines and two helicopters, as well assistance from local resources assigned to the fire. As of 2300 hours Monday night, there were 10 acres that had burned in extremely steep terrain and 50% containment achieved. Crews were expected to monitor the fire throughout the night. A Type 3 IMT unit is expected to assume fire control on Tuesday morning.